Take rice in a bowl and add water. Wash the rice thoroughly and drain the water. Add the measured water to the washed rice and let it soak for 30 minutes. After 30 minutes, remove water from the soaked rice. Do not throw the rice soaked water—we will need it to cook the rice. Heat a pressure pan. Add ghee to the pressure pan and melt it. When ghee is melted add cashew nut pieces and fry stirring till they change color to golden color. Drain the fried cashew nut pieces and keep them aside. In the remaining ghee add cumin seeds, cinnamon, cloves and bay leaf. Fry stirring well. Add the soaked and drained rice and fry on medium heat stirring. Fry till all moisture evaporates and till rice does not stick to the bottom of the pan. Then add the rice soaked water, green peas and salt. Mix all well and cover the pressure pan and cook. After first whistle cook on low flame for 5minutes. Wait till the pressure cools down on its own. Remove the lid and mix the pulao with a fork. Transfer the pulao to a serving bowl and garnish with fried cashew nut pieces. Serve hot with any raita. 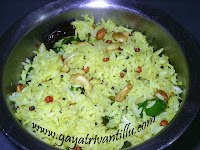 Use long grain and aromatic rice like basmati rice for better taste and good look. Soaking the rice cuts down the cooking time and the rice will get cooked perfectly. Frying the rice till all moisture evaporates is important. Frying the rice well coats each grain of rice with the ghee. Pressure cooking times may vary from person to person. Cook as you normally cook your rice in a pressure cooker. Fluffing the rice with a fork will not break the cooked rice grains. As there is no other vegetable in this dish serve this pulao with baingan raita—then the meal will be full with rice, vegetable and curd. To retain the color of green peas---cook the green peas in a microwave oven adding little salt and add this to the cooked rice. If there is any leftover rice preparing this pulao will become much easier. Gayatrigaru, thanks for taking time to host your website. I cooked longtime back when I was in college in US. After that I always relied on my wife and never tried my hands at cooking. Now, when I needed something quick your videos are very helpful. Hope your site will generate enough funds to support itself.